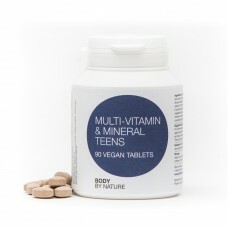 Body By Nature have designed the tablets to be small so they are easy to swallow.This multi-vitamin has a high level of B vitamins - B1, B2, B6 and B12 plus other important vitamins and minerals makes this a great product. These supplements are made from plants NOT synthetic chemicals like other brands. For teenagers: a FOOD STATE two-a-day multivitamin & mineral in a very small tablet. This supplement is high in antioxidant minerals and B-complex vitamins. This supplement comprises a food base of ‘inactive lactobacillus bulgaricus’ a native and friendly bacterial inhabitant of the human GI tract. As this bacteria fits into normal metabolic pathways it acts as a natural carrier to help give optimal absorption and utilisation of the nutrients. For teens of all ages 2 Tablets a day. or take as directed by a practitioner. Non-Active Ingredients: Vegetable stearic acid, hydroxypropylmethylcellulose, glycerine. Non GM & Free From: Wheat; starch, gluten; soy; live yeast; added sugars, colourings, flavorings & preservatives.